Overall, the company offers a wide range of CertiPUR-US® certified, low-cost mattresses. If you’re looking for an affordable mattress with lots of options, Bob-O-Pedic is a nice place to start looking. They offer 23 mattresses in total, including ones constructed with memory foam, gel memory foam, coil hybrid mattresses, and mattresses made with memory foam and latex. However, with competitive prices — the mattresses start at $100 —are the Bob-O-Pedic mattresses just hype? We’re here to break down every detail about each mattress, compare firmness level and feel, showcase common reviews, and give you the lowdown if this mattress company is a solid choice for your next bedding purchase. Should I Buy a Bob-O-Pedic Mattress? All Bob-O-Pedic mattresses are CertiPUR-US® certified, which is pretty commonplace among most mattresses. 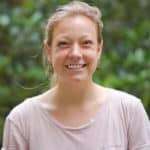 It simply means the foam in the bedding has been tested to meet CertiPUR-US standards, including being made without ozone depleters, flame retardants, mercury, lead, and a handful of other toxins. The Bob-O-Pedic mattresses also utilize temperature sensitive memory foam. Some of their mattresses are available in firm, plush, and even dual comfort levels (meaning one side is firm and the other side is soft), so you can choose the firmness level that suits you best! Since 2003, the Bob-O-Pedic product line has expanded to stay up-to-date with the new mattress design and manufacturing techniques and trends. They offer basic beds and more luxurious options, all of which are deemed to be great values that offer immense support and comfort. Value: Bob-O-Pedic claims that every mattress is of exceptional quality and ultimate comfort at an unbeatable price. Comfort: Each mattress is made with temperature sensitive memory foam that is said to conform to the shape of your body for increased comfort, gentle support, and pressure relief. Coolness: The stretch knit cover on select Bob-O-Pedic models (Sky, Twilight, and Sport Hybrid) is constructed with innovative phase change material threads that provide breathability and allows for temperature regulation. Let’s look at the 23 different mattresses, categorized by memory foam, hybrid, and innerspring models. From there we’ll compare each mattress side-by-side and look at things like price, firmness level, tailoring technique, and height. Gel 4.5” Sleeper Mattress. This Bob-O-Pedic bed features a gel memory foam that is combined with normal memory foam for extra plushness. Gel foam is pretty similar to memory foam; it has gel microbeads mixed into the memory foam that is designed to wick away heat. This mattress comes with a stretch knit fabric cover. 6 Mattress. The 6 Mattress is a tight-top memory foam mattress with 4.5 inches of an HD poly “base” foam for structure and support. This is combined with 2 inches of memory foam. It only comes in a Twin or Full size, making this a nice option for a kids bed, or a daybed or trundle bed. Eclipse Gel. The Bob-O-Pedic Eclipse Gel Mattress combines ventilated gel memory foam with wait for it — charcoal — to regulate temperature, control odors, and provide nice pressure relief. This bed, which is medium-firm, ships compressed in a box. 9 Gel Mattress. This memory foam bed includes a layer of gel infused memory foam for coolness and comfort. The cover includes a stretch knit for extra softness. Bob-O-Pedic’s gel memory foam features memory foam infused with gel for extra comfort. The gel also helps keep you cool by dissipating body heat. Sky Mattress. The star of this bed is a unique self-ventilating fabric used in the cover. The mattress is encased in an ultra-light, high-performance woven cover that uses phase change material for extra breathability. This technology is coupled with memory foam. You have the option of choosing between three comfort levels: firm, plush, or dual. Gel Mattress. This gel mattress includes a knit cover, gel glaze, and a layer of latex foam for additional support and comfort. You can choose from extra-firm, plush, or dual comfort levels. MyBob Gel Mattress. The MyBob gel mattress has been recently reconstructed. It now has activated charcoal infused memory foam and a glazed, gel-on-gel infused memory foam (good for airflow!). The gel also helps regulate the mattress temperature. Choose between firm, plush, or dual comfort levels. Refresh Mattress. The first layer of the Refresh mattress is a breathable, stretch knit cover. Then comes an anti-microbial safeguard fiber to promote a healthier sleep environment. A layer of Talalay and gel-infused latex is next, followed by memory foam. Overall, this mattress is known for providing good durability, resilience, and pressure relief. Twilight Mattress. This comfy mattress has 14” of supportive and comfortable foam and includes a micro coil in the comfort layer for added conformance. It uses gel memory foam, phase change material for temperature regulation, and a stretch knit cover. The Twilight comes in plush, firm, or dual comfort options. Solstice Mattress. The solstice is a luxury, reversible duvet top mattress. One side is quilted with natural wool, while the other is quilted with a cooling gel. Underneath is gel memory foam combine with talalay latex. This bed only comes in Queen, King, and Cal King. Sorry kids! Val-U-Pedic. The Val-U-Pedic mattress is the most affordable hybrid bed option, coming in at $269 for a Queen. The core is a 13 gauge verticoil innerspring unit, which includes a soft knit cover and a layer of memory foam. This is a tight-top, medium-firm mattress with a tight-top, which means it does not have additional pillow-like padding on the outermost layer. Splendor Mattress. This mattress is designed with unique pressure relief. It’s made with a strong verticoil system, layers of foam, and a lumbar layer of memory foam. This one is definitely on the firmer end, and has a tight-top. Eclipse Hybrid Mattress. Bob-O-Pedic calls this bed “a little piece of heaven.” It’s paired with ventilated gel memory foam with charcoal. The core is an individually wrapped coil system for conformance and support. It’s 9 inches thick and has a medium-firm feel. 9 Hybrid. The main event in this hybrid mattress is the combo of the cooling gel-infused memory foam with individually wrapped coils. It has a tight-top cover and is medium-firm. Whisper Mattress. This mattress is considered pretty cozy due to a strong verticoil system with generous layers of foam and a lumbar layer of memory foam on top. It’s a 10 inch, Euro Top style mattress that’s considered super soft — a 2 out of 10 on the firmness scale! Anticipation Mattress. This mattress starts with a luxury stretch knit cover with Antimicrobial safeguard fiber. Then comes a memory foam lumbar layer and individually foam encased coils. It’s available in extra firm or euro-top plush. Midnight Mattress. The Midnight mattress features a durable, individual encased coil system coupled with a layer of convoluted foam, a layer of gel memory foam, and a lumbar layer of latex. Choose between euro top plush and firm. Sport Hybrid Mattress. By the name of this bed, our guess is it’s good for recovering sore athlete muscles! In any case, this mattress is a blend of a cool cover is made from temperature regulating fabrics, ventilated memory foam, and an individually wrapped coil system. It comes in plush, firm, and dual comfort options! Hybrid Mattress. This hybrid mattress features a quilt cover with stretch knit fabric, followed by gel memory foam and an independent coil spring system. There is no information online regarding the firmness level of this bad boy, so make sure to feel this one at a retail store! Black Label Gel Mattress. I guess black label goes beyond Johnnie Walker. This mattress starts with a quilted knit cover followed by an anti-microbial safeguard fiber. The comfort layer includes copper infused foam, gel-infused latex, and memory foam. Then comes the individually wrapped coil system that’s foam encased. Choose between extra-firm or plush! Passion Mattress. The Passion Mattress features over 2,100 coils in its innerspring system. It also has a cover made from natural cashmere, and a layer of gel and copper infused memory foam for pressure relief and temperature regulation. This is a eurotop style that is super soft — we’re talking 1 out of 10 on the firmness scale. Obsession Mattress. This mattress is the most expensive hybrid bed in the Bob-O-Pedic line. It’s made with gel-infused memory foam, latex foam, and utilizes hand tufts throughout. The cover is a plush, Belgian damask featuring silk and wool blend fibers. It’s a eurotop style with a medium-firm feel. Perfection Mattress. There is only one true innerspring mattress on the Bob-O-Pedic line, but according to Bob, it’s pretty “perfect.” It is only available in Twin or Full, but is marketed as a great, inexpensive mattress option. It’s a tight top style mattress with a medium-firm feel. The following tables show comparisons between the memory foam, hybrid, and innerspring mattresses. Each table highlights the major functional components of each Bob-O-Pedic mattress. Which is the best Bob-O-Pedic Mattress For You? As we’ve discussed, Bob-O-Pedic beds run the gamut from memory foam, to hybrid, to innerspring. Memory foam is known for its deep compression support, pressure relief, and body-contouring properties, while hybrids are a great way to experience the pressure relieving benefits of memory foam while retaining the classic feel of an innerspring mattress. Innerspring mattresses offer a lot of bounce and good temperature control, supporting the body by pushing back with a similar amount of pressure that the body applies. Let’s break it down. Let’s look specifically at the firmness levels of each Bob-O-Pedic mattress. As we described above, many mattresses only come in one comfort level, which is depicted by a number between 1-10, 1 being the most plush, and 10 being the most firm. Bob-O-Pedic rates its “plush” beds at about a 3, while firm is a 6 and ultra firm at an 8. Some models come in various comfort levels so you can choose which level of firmness best suits you. For these mattresses, we’ve broken them out by comfort level; you will see these twice on the chart, but that’s because you can choose between a plush option or a firm one. Note: There is one mattress on the Bob-O-Pedic line that does not disclose its firmness level. That’s the “Bob-O-Pedic Hybrid” mattress that is 11.5” thick and is $899 for a Queen. There are a few mattresses that let you select a “dual” comfort layer, which means you can flip your mattress so one side is plush (about 3-10 on the firmness scale) vs. firm (about 6-10 on the firmness scale) — all according to Bob-O-Pedic. If you’re one of those people that has a hard time making decisions, these could be great options! Now, let’s talk overall feel and comfort. Are these beds known for off-gassing? Is there a lot of motion transfer? Do they get hot? For the purpose of this article, we’re going to discuss general themes we found around comfort and feel across the entire Bob-O-Pedic line. Every mattress will feel different, so make sure to read up on individual reviews for each bed and test them out yourself! Overall, Bob-O-Pedic memory foam mattresses are reviewed well for their ability to conform to the body, provide good pressure relief, and isolate motion quite well. However, there is said to be a lot of off-gassing odors, and despite the materials used to pull heat away, still get hot. They also aren’t known for providing ample edge support. The hybrid models across the board are told to be “virtually silent, especially keep cool, and have solid edge support. They don’t do as good a job at isolation motion, and also are at an off-gassing disadvantage. 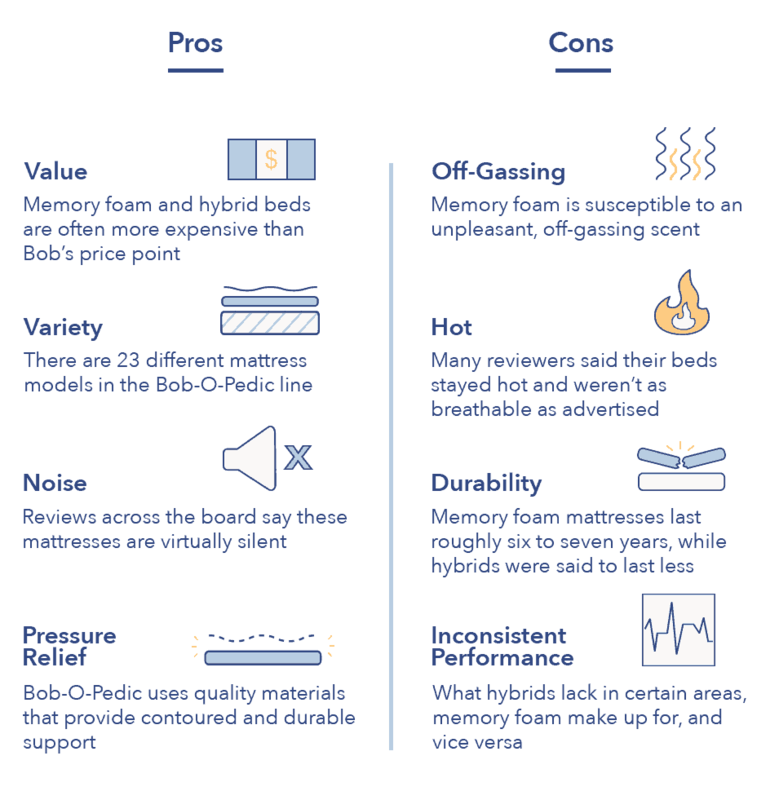 Here are general pros and cons of Bob-O-Pedic beds, along with common reviews! Value. The price really is right when it comes to Bob-O-Pedic. Memory foam and hybrid beds are often more expensive than the beds that Bob offers. That said, there are quite a few beds that get into the high hundreds and thousand-price range, which isn’t that different from other mattress companies, especially the newer bed-in-a-box brands that are also competing with luxury mattress models. Variety. There’s a lot to choose from when it comes to the Bob-O-Pedic mattress line. Not only are there 23 different models — there are different comfort levels within many of those models, along with the option of choosing a dual bed that is both soft and firm. You also have a variety when it comes to price, so you can find something that fits your price range. Noise. Reviews across the board note that these mattresses are virtually silent, a nice quality when you really just want some peace and quiet sleep. Pressure relief. Bob-O-Pedic uses quality materials that are known for providing contoured and durable support. The use of memory foam, Talalay latex, gel foam, and innerspring systems, all do its job when it comes to relieving pressure and helping you feel ache-free in the morning. Off-gassing. Memory foam is always susceptible to an unpleasant, off-gassing scent — especially once you get your bed. Many reviews confirmed that the Bob-O-Pedic memory foam has also fallen susceptible to this unfortunate side-effect of using memory foam. Even the hybrid beds (which include memory foam in the comfort layer) are known to have an off-gassing smell. Luckily, many reviewers said this scent faded pretty quickly. Hot. If you sleep hot, this might not be your best bedding bet. The Bob-O-Pedic memory foam beds (similar to other memory foam mattresses) had many reviewers who said their beds stayed hot and weren’t as breathable as advertised. Durability. Many customers report that the memory foam mattresses last roughly six to seven years, which is a decent average lifespan, but could be longer. (Make sure you have a warranty that is more than 5 years!) The Bob-O-Pedic hybrids were said to last for less time. Inconsistent performance issues. Many people said the memory foam beds offer great motion isolation, whereas the hybrids don’t. On the flip side, The hybrids have solid edge support — a feature the memory foam beds lack. We scanned through a handful of Bob-O-Pedic reviews online to search for common themes. Here’s what we found in regards to top praises and critiques. “Worth the price” Many (many) people spoke to the fact they felt like they got a good price for these mattresses. “Soft and comfortable” Most of the Bob-O-Pedic beds use a soft knit cover, which many people said was lovely and soft to the touch. Others said that generally, the bed provided good and comfy pressure relief. “Found just what I was looking for!” Lots of people love Bob-O-Pedic because they find something that suits them. Many spent time laying on lots of different beds until they found something that matched exactly what they were looking for. Since lots of mattress brands now only offer a few types of comfort levels, this is definitely a nice added perk. “It was defective” When it comes to durability, not all of these beds get rave reviews. A handful of customers said their beds would breakdown in just a few short years and had to deal with less-than-helpful customer service to try and use their warranty. “The off-gas scent stayed for weeks” One reviewer specifically wrote: “We opened the packaging when we brought it home and immediately smelled a terrible odor. We were told to let it air for a few days and we did, however, a few days turned into weeks.” Others said the off-gas scent was a major turnoff, and they had to keep their windows open (even in winter!) to help get rid of the smell. “It sags” Many people said that the middle of the memory foam beds would begin to sag. Others said it was far from supportive, and led to newly developed body aches and pains. Ouch. Where to buy: You can buy online via the Bob’s Discount Furniture website or you can go to a Bob’s store if there is one near you. Sleep trial: You have 90 days to try your new mattress. Within 90 days, you can also swap out your mattress for a different model, but will have to pay the difference if the next mattress is more expensive. Refund: Within those 90 days, you can get a full refund for your mattress, minus the delivery and/or set-up fee associated with your original purchase. Delivery: There are four different ways to get your mattress. You can choose “Bob’s Delivery Service,” which is a white glove delivery service that comes with a fee of around $150 (it depends on how much your mattress costs). There’s an express delivery service that is more expensive but allows you to get your mattress faster via FedEx. There is also a “Factory Direct Shipping” with a small fee. Lastly, you can always see if there’s a Bob’s Discount Furniture store near you and pick it up yourself. Warranty: Every mattress has a unique warranty length, which varies from 5-20 years. Bob’s will only cover “manufacturers defects” which include things like wires that are loose through the fabric, broken or loose support elements, or known sagging if the mattress is being supported with a proper foundation. Box springs & foundations. Choose from 13 different box springs and foundations that start at $59 and go up to $438. Adjustable beds. As if 23 mattresses wasn’t enough. Bob’s offers 54 different types of adjustable beds which come with the different mattress model types we explained in this article. Some of them also include smart features that sync to an app on your phone. Bedding. If you need a coverlet or comforter set, you have a hefty 40 different options to choose from! Pillows. If you’re bad at making decisions, then you’ll be happy to hear Bob’s “only” offers six different pillows, that range from contoured to gel-infused to a good ol’ classic memory foam option. Protectors. Mattress and pillow protectors help add longevity to your bedding products. Bob calls this its “Goof Proof” line, with nine different options to choose from. Frames & Rails. If you need a good bed frame for your mattress, there are five different options for you — all under $100. Ok! Now that you’re a Bob-O-Pedic pro, one question remains? Should you purchase one? We can’t tell you what to do, but we can help you decide based on the most important qualities a Bob-O-Pedic mattress provides its sleepers. You’re on a budget. It’s clear that Bob-O-Pedic offers memory foam and hybrid beds that are significantly more affordable than comparable models. If you want a quality mattress without spending a ton, there are many options to choose from within the Bob-O-Pedic mattress line. You love memory foam! Bob prides itself with the use of memory foam, which will provide a type of sleep experience that some love and others aren’t a fan of. Memory foam general provides a feeling of sinkage and contour, like you’re being hugged by your mattress. It has a slower response rate and sometimes isn’t as breathable as spring mattresses. Pressure relief is important. Across the board, Bob-O-Pedic seems to do a good job at relieving pressure points. Many said it indeed helped with aches and pains. Remember, though, that some of these reviews cames from folks who recently purchased their mattress. Others started to complain about durability and support a few years in, so make sure to read the fine print within your specific warranty to see if you’re eligible for a replacement if your mattress starts to sag. Overall, Bob-O-Pedic offers a lot of mattresses to choose from, letting you pick a bed that best matches your needs, wants, and budget. And with a 90-day sleep trial, you can truly see for yourself if the “discount” mattress option meets your bedroom expectations. For more information on what to look for when picking out a new bed, check out our handy how to choose a mattress guide.